I never realized how sad the story of Medea is. Not only for the fate of Medea’s children but for her self-directed pain to spite the man who has betrayed her. Lars von Trier’s film, based on an unproduced screenplay by the great Carl Th. Dreyer, takes a humanist approach to this old tale, and credit is due to both great Danish artists. Ironically, Medea’s murder of her own children shows her with great compassion. After hanging her younger son, pained at doing so, when she hoists her older boy and he hangs by the noose, she holds his body up for as long as her arms can manage. Based on Euripides’ play, Kreon, King of Corinth, in rewarding the adventurer Jason, Medea’s husband and leader of the Argonauts, gives him the hand of his only daughter. One of the most impressive scenes is when King Kreon tells Medea that she is banished from Corinth. She is out picking wild grains on a misty field. The King is apprehensive, and his decision to banish Medea and her children comes from a need to protect his daughter. Medea loses herself in the mist. Kreon cannot find her though her voice is everywhere. They speak as concerned parents. Medea is fearful for the status and well-being of her children. “You love yours, and I, mine,” the King tells her as he fumbles on the ground. Medea, as played by Kristen Olesen, reminds me so much of Renee Falconetti as Joan of Arc. I think this was a deliberate choice by the director. Like Dreyer’s handling of St. Joan, Medea comes off here as a human woman. She is feared, yes, but in her moments alone she expresses great sadness and regret for her betrayal. In a way, the romance of Medea and Jason is one of the most passionate ever written. Medea has given all of herself and when she is cast aside, only an equally measured reaction from her lover is enough to satiate her. She is not selfish, just tied profoundly to Jason and not even the love of her children can substitute. She must wound him, and this film treats the humanity of this drama most effectively. Von Trier uses subtle stylistic elements that creep up almost subliminally. In the scene where Medea decides to sacrifice her children, she and her maid are in the foreground, Medea’s sleeping children in the background. Medea speaks of the pain of being a woman and a mother as the background gets unnaturally closer... until we are zoomed in on the beautiful faces of her and Jason’s offspring while in the foreground the women remain in scale. At other times, the colors of the background are monochrome and washed out, and these add a stark bite to the central figure in the foreground of these shots. Perhaps due to the deteriorating conditions of the source material, I felt these effects were brilliantly conceived and hidden beneath the movie’s ragged textures. Von Trier shot Medea on video, probably a financially motivated decision but one that aids the film immeasurably. The movie looks as if it were shot on parchment paper. Every image is cross-hatched and stained with age. 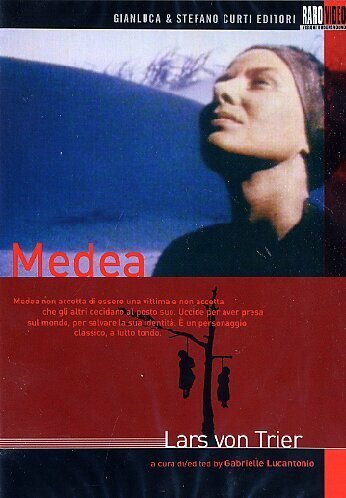 Like the silent films of Dreyer, Medea feels more like a document of the past rather than a movie. The rawness of the production is widely evident in the costuming, a reserved, minimalist approach, the set design, and above all the photography. I love the look of this movie! Von Trier uses the natural landscape to heighten the scale of his characters’ drama. From overhead shots of flailing fields to the ever-expressive water, to the poison grains that will cut short the time of Kreon and his daughter, von Trier calls upon a Scandinavian tradition to link man’s struggle with his land. The result is as naturalistic a film on this subject as can ever be made. Pasolini’s 1969 version, a better film than this, took a more operatic and villainous approach, but von Trier’s quiet, contemplative cinema breathes fresh life into this archetypal story. The unavoidable question is who would have made the better film? Dreyer was a master. Though his movies are cruder, Lars von Trier has proven himself a film artist. Both frequently toy with female leads and feminist themes in their work. We get a sense that the director respects Dreyer. The opening title cards constitute a personal message from von Trier, who claims he did not try to recreate a Dreyer film but, with due reverence, the film is “a personal interpretation and homage to the master”. To say which need not bother being said, that we all would have loved for Dreyer to have made at least one more film, is pointless. Von Trier made this film, and we have von Trier’s Medea. In a glimpse of the perversity that would follow from this always confrontational director, the scene of Medea’s sacrifice is a sadistic and simultaneously calm experience. As I said, Medea kills her children with utter sympathy and love. Her oldest son understands this, and helps Medea with his brother first. The camera stays on Medea’s face with her son’s torso by her side, and we see the older brother dragging down the boy’s feet to make sure the job is done. We then see Medea crying at a distance, her dead son hanging over her head, and the live son brings her his noose. It takes a lot to make a scene like this work. It lingers and naturally is unpleasant but works so well in this very realistic take on the material. This scene falls in line with what we have come to expect from von Trier. Medea is a fitting project in a distinguished career fueled by women who often direct madness and pain at themselves. I would love to read Dreyer’s script to see where the changes were made, but this film is shockingly human with nearly inhuman deeds and von Trier’s approach is quietly intense. Images that bookend the film speak volumes of the power that the feuding lovers possess. Medea begins with its title character lying on the beach. She knows her husband has taken another wife. Her hands dig into the sand one claw at a time. After the end, Jason, upon seeing his hanging children and robbed of the opportunity for revenge, unsheathes his sword and stabs wildly at the earth. From the very beginning I knew Medea’s hands would win.